This is a eye versus eye capturing race with two big eyes. After White 1, both groups have 13 liberties. Black has 10 liberties inside his big eye, and he has the bigger eye, so he counts the 3 inside liberties. 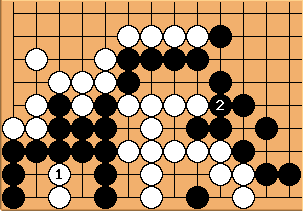 White has 7 eye liberties and 6 outside liberties. Given the size of the groups, we can safely assume White 1 to be sente. Black 2 wins the capturing race. Hereafter, White has 13 huge ko-threats, so she is virtually assured of winning any large ko that pops up in the game. Her result is thus "many ko-threats in sente". Gronk: Moves such as are often a bit more rational than suggested by this comment. Consider a game with time limits and players who appreciate their own limitations in skill. There is the case that Black doesn't know how to count liberties (and recognizes this) and reading this out brute force is not that easy whent his clock is ticking. Instead of taking a risk that he will get it wrong he plays . Consider loss of sente a risk premium. That's rational, given the uncertainty the player acknowledges in his own understanding and the constraint of the clock. Consider also the case that Black knows the situation here and doesn't want to give Whtie ko threats or doesn't want to risk further complication later (when time may be against him if his clock is low). Again, paying a risk premium here is rational, given the uncertainties. There is at least one instance for which is obviously not rational and that is when loss of sente clearly loses the game (due to some situation elsewhere). In that case, Black should not even consider , even if he can't read or count this out. That is, Black must risk. It is quite common for kyu players not to take a risk when it is necessary, even when they recognize it. Later they say "but I couldn't risk losing this group." The reply, "but you clearly lose the game if you 'save' it" should end all uncertainty. Of course, in this case, Black would have paid the risk premium unnecessarily since he still wins the capturing race without . This should really make it plain that there are times when really is just too slow, even considering the percieved risks.